Since it is almost mid-March, I suppose I should get my list of books from February jotted down. To say that I am running a bit behind is, well, clearly obvious. In no particular order, here we go! Eleanor Oliphant is Completely Fine (Gail Honeyman) – Let me get the disclaimer out of the way from the first. There is language in this book; sprinkled through out in conversation and thought. If you are sensitive to that, please take that into consideration. There were also two scenes that took me by surprised and that I quickly skimmed through. However, this book, this journey with Eleanor was worth it. I did not know much about this book when I began. I had seen it several times on Instagram and decided to give it a go. It is a beautiful story that shows the power of the simple act of friendship and that we should love the unlovely. Is about forgiveness and healing and love. I’m so glad I got to know Eleanor. Greetings from the Flipside (Rene Gutteridge) – A Christian Fiction story that had an intriguing story line but lacked in a bit of back story development. I think if the back story of the two characters, their connection, has been better fleshed out that this would have been super fun! I enjoyed it and a relaxing weekend read but felt a bit cheated when I was done. Who I Am With You (Robin Lee Hatcher) – This was a new release from an author that I typically enjoy. Humph. What is up with me? Again, I felt that there was something lacking in the connection of the two main characters, Jessica and Ridley. Hatcher is actually telling two stories at once. The book flips between the story of Jessica and her great-grandfather. I was disappointed and felt Jessica’s and Ridley’s relationship wasn’t realistic. The Interrupted Tale: Book Four of the Incorrigible Children of Ashton Place (Maryrose Wood) – This was, of course, a read aloud with my younger children (and husband). We continue to enjoy Miss Lumley and the Incorrigibles. Not only is it an engaging story line but Ms. Wood understands that children are smart and witty and funny. I will confess that Book Four has not been my favorite but still excellent! I have Book Five on my shelf for us to read this month. We definitely recommend this series! A Brief Note: When I’m reading a book or have a book I want to read, I dislike when someone tells me all the details. I often think, ” well, now I don’t have to read it.” So this post isn’t a review of the books I’ve read; just a list to share. If you would like more details, let me know in the comments. I will always try to mention questionable content and other important tidbits. Pride and Prejudice (Jane Austen) – We finally finished! This was our Wednesday with Austen selection and since we only read it on Wednesdays, it took a few months to finish. However, it was absolutely wonderful and I loved it! My older children had read it on their own but it is a classic worthy of being re-read. Confession: It was my first time reading Pride and Prejudice. Why, why, why did I wait so long? I loved it. Of the Austen books I have read so far, it is my favorite. I did read this aloud to all of my children that are home during the day (17 down to 2). Do not doubt the ability for younger ones to not only follow the basic story line but to enjoy it. Ok, the two year old didn’t really care but that is okay. The Austen Escape (Katherine Reay) – I happened to see this on the shelf and grabbed it. I had heard good things about this author and her books. The Austen Escape was an enjoyable weekend read. I think you definitely have to appreciate Austen to enjoy a book like this. It was fun, enjoyable, and interesting. If you are in need of some weekend reading or a book to have tossed in your bag for the waiting room, The Austen Escape is a great choice! Blue Ridge Billy (Lois Lenski) – I love Strawberry Girl and decided I wanted to incorporate Lenski’s other regional books into our school readings. Since Blue Ridge Billy is set in the Blue Ridge Mountains of North Carolina it was an easy choice. So, I didn’t enjoy it as much as Strawberry Girl. However, I made this mistake of dragging out the reading of this book. I was suppose to read it weekly but I skipped more than a few weeks. Despite that my children, 11, 9, and 7, enjoyed Blue Ridge Billy. They always wanted me to read more. They wanted to know if Billy was going to get his banjo and what was going to happen to his dad (they were not fans of the dad). If you were to choose to read this, be consistent. I read the last few chapters in a week or so. It made a huge difference. The Way of the Wilderking (Jonathan Rogers) – This is Book Three of The Wilderking Trilogy. If you have not read this trilogy, read it. Read it aloud to your children. Read it for yourself. It is excellent and funny and exciting and heartbreaking and adventurous. You want to see Aidan’s journey unfold. You want to travel into the Feechiefen and meet the feechies. Trust me. This was my second time reading this trilogy aloud. I read aloud about seven or eight years ago. I decided that my son, 9, would love this trilogy. So I read it aloud again. The boys in your life will love it. So will your girls. Your husband might laugh the loudest. Can you tell that we highly recommend this trilogy? Whose Body? (Dorothy Sayers) – I was never a fan of mysteries until two of my children developed a love of mysteries. In reading books to preview them and in reading books to join in conversation with them, I have come to love certain murder mysteries. I have had Sayers’ Lord Peter Wimsey mysteries on my TBR for some time. I finally decided to just read it and stop putting it off. Oh, I love Wimsey! Absolutely delightful all the way around. Highly recommend. Rebecca (Daphne du Maurier) – This was as impulse selection. One of my older daughters read this and made a comment or two that had me so eager to read this book. I grabbed a copy from the library. And like so many older books, they give you no book summary or synopsis. I did not ask my daughter for details. I didn’t look it up online. I opened the book, started reading, and let the story unfold before me. Oh my. From the first page, I was hooked. My two daughters that had read it and I had the same exact reaction to the plot twist and resulting outcome.There may have been a character that I wanted to just ask “What?!?!?! ?” Highly recommend. I am eager to read more of du Maurier’s work. That was a super quick look at what I read or finished reading in February. I will try to post soon about how my reading for the Back to the Classics challenge is going. Hopefully my March reading will be just as delightful as February. Please share what you are reading!! **Please note that this post contains affiliate links. The links in no way alters your online shopping or browsing experience. I earn a small percentage of purchases made via my links. Thanks so much! A few months ago I finished Chapter 4, Authority and Docility, of A Philosophy of Education. This is Volume 6 from Charlotte Mason’s writings. Many times I have sat down to write up this post, but the words would not come. Naturally in the middle of the night when I could not sleep I wrote many eloquent thoughts on this chapter. Sadly, I was never motivated to get up and jot those words down. So today I sit and I write. Being me, I can’t move ahead in this book until I get this post somewhat completed. The book sits on my desk and taunts me daily. This rainy afternoon presented the perfect opportunity. I wrote a really long blog post this afternoon. And I just deleted it. I’m not sure how I could elaborate on Chapter 4 without feeling redundant. I loved what this chapter had to say. I have quotes written down in my Commonplace Book. I have thought much about this chapter; about authority and docility. I find myself agreeing with Miss Mason on so much here. I had a long conversation with my husband about the words authority and docility. On authority, we tend to have a natural reaction to resist it? I tell my toddler that standing on the table is not acceptable. He stands on the table. i discipline him. And he does it again. We can say that he is “testing his boundaries”. But if I, as his authority, have set those boundaries then he is resisting my authority. That in no way sums up the chat I had with my husband. My point is that I think we must train our children and ourselves to embrace the beauty and order that authority gives to us. It is a blessing. I love what Miss Mason had to share on those who are in positions of authority and how that responsibility it to be handled. Then we have docility. I do not know about you but this word is not a part of my daily vocabulary. This is the attitude that we would desire for our children (and ourselves). This spirit or attitude that is open to instruction and learning. This is why I am reading through Charlotte Mason’s volumes. This is why I read my Bible throughout the week. An attitude of docility is why my book stack never gets smaller. I yearn to know more; to be taught more about so many things! As I look at myself as a parent and an an educator, I see that I can better handle and respect the responsibility of authority I have been given if I also have docility. They are a beautiful pairing, are they not? If you have any thoughts to share on this volume or this particular chapter, I would love to hear them. If you have not read this chapter before, go read it and then come back and share. (If you do not own a copy of A Philosophy of Education, you can access if for free and read Chapter Four here. Hopefully I will be more aware of the attitudes of my children and myself with is comes to authority and a willingness to learn. So now on to Chapter 5: The Sacredness of Personality! *Affiliate links may be used in this post. The links in no way change your shopping or browsing experience. A small percentage is earned when a purchase is made. Last year a book at the library caught my eye, The Saturday Night Supper Club. Heading into the weekend, I wanted a few casual fun reads to have on hand. Not only was it an enjoyable read, but I even learned a bit about what happens behind the kitchen doors of a restaurant. 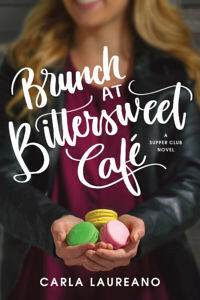 When I saw that Carla Laureano had a new book, Brunch at Bittersweet Cafe, I added to my To Be Read. Every one needs to have a ready list of fun, relaxing books to read, am I right? Confession Time. I am a huge fan of the Great British Baking Show. I love Mary Berry. I am always amazed at the creations and combinations the contestants come up with on the show. I am a Plain Jane in the kitchen and am perfectly content in that. But I still enjoy watching others create. This book, Brunch at Bittersweet Cafe, had that same type of feel to it, I think. Not only did Melody whip up delicious baked goods, she matched them with favorite literature and many were tied to her life with her grandmother. What is not to love, right? There’s more to Melody’s story than yummy croissants and the perfect loaf of bread. There is heartbreak and pain. Disappointment and devastation. There is forgiveness and restoration. There is laughter and joy. Naturally there is also a gorgeous guy who is not interested in forever and has a life plan heading in the opposite direction of Melody’s. He’s not a bad guy but his view on marriage has been tainted. They are both carrying hurt from the past. Fortunately, macaroons, which happen to be made with almond flour, are still on the menu. 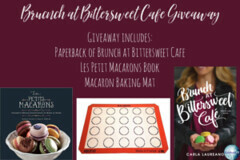 To celebrate her tour, Carla is giving away a grand prize package of a macaroon baking mat, a macaroon book, and a paperback copy of Brunch at Bittersweet Café!! Disclosure: I received a copy of this book in exchange for my review. All opinions and thoughts are my own. Affiliate links may have been used in this post. The links in no way alter your browsing/shopping experience. I earn a small percentage on purchases made following my link.